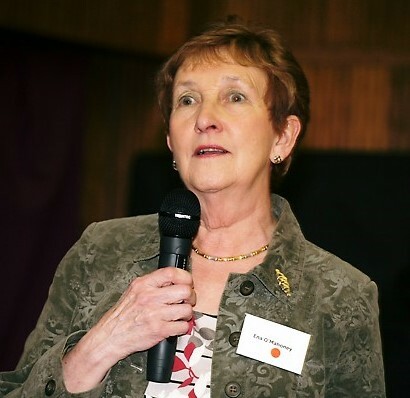 Ena O’Mahoney, Vice-President of the Irish Senior Citizen’s Parliament spoke yesterday at the seminar, ‘Enriching the College Community with Older Lifelong Learners’ in Trinity College. She told her audience of the wealth of ‘mental capital’ accrued by older people in this country and how, if utilised, it could benefit the whole of society. The ISCP warmly welcomes this initiative taken by Trinity College. TCD Vice-Provost/ Chief Academic Officer Prof Patrick Prendergast; Vice President of Irish Senior Citizens Parliament Ena O'Mahoney; Age Action Ireland representative Senator David Norris; Psychology Student Philip Martin Murray; Minister of State with Responsibility for Lifelong Learning Sean Haughey; Lecturer in Adult Nursing Jacinta Kelly and event organiser Jennifer Ryan.